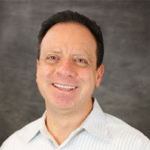 I recently had the pleasure of sitting down with Monica Paolini, the founder and president of Senza Fili Consulting, a firm that provides analysis and advice on wireless technologies and services. Monica always has an interesting perspective, and I enjoyed discussing the unprecedented momentum we’re both seeing around CBRS shared spectrum. As Monica probed me about the development of the ecosystem and how it all came together, I was again reminded of how much we’ve all accomplished in a relatively short period of time. I can now see the goal line, and look forward to the next big milestone of FCC Certification, followed quickly by commercialization early next year. I thought I’d share some of the highlights of the interview. For the complete interview, you can tune in here or download the transcript here. Monica: WHAT IS SPECIAL ABOUT 3.5 AND CBRS IN THE US? Iyad: What’s new about it is the three-tier model, which comes back to this much tighter reuse, and the ability to use this band that’s fairly massive – 150MHz – and that is lightly used by various government agencies and commercial incumbents. What’s also new is this scheme that adds general access and looks like an organized form of unlicensed, Wi-Fi access, with the ability to create a new licensing scheme. There is quite a bit of innovation, but ultimately, this is about a much tighter reuse, tighter packing of spectrum to create opportunity that wasn’t there before. Monica: That’s very important, because there’s a hard limit to how much spectrum we have. The more efficient we are, the better off everybody is. CBRS requires the creation of a new ecosystem, because in addition to transmission, you need coordination among spectrum users. WHAT IS THE SPECIFIC ROLE OF FEDERATED WIRELESS IN THIS WHOLE ECOSYSTEM? 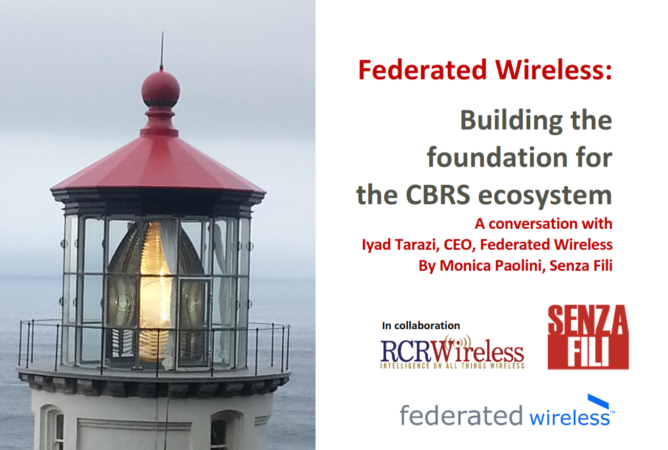 Iyad: Federated Wireless is building software and hardware to enable access to the spectrum in new ways. Our deliverables are two things. The first deliverable is to protect the incumbents in the spectrum, to allow the majority of the spectrum to be accessible. The second deliverable is to automate, as much as we can, the RF engineering steps in the FCC-mandated process, in order to make the spectrum dynamically available for anyone. Ultimately, what we provide is software and hardware tools to make CBRS work. Monica: AND WHAT DO WE NEED IN THE OVERALL ECOSYSTEM TO GET CBRS WORKING? Iyad: In the old days before shared spectrum, spectrum was a very static commodity, where a carrier would go get some spectrum through an auction and then ask equipment makers to build to that specific spectrum under an RFP process. In this shared spectrum model, there’s now a new element, new software in the network that allows a dynamic sharing of spectrum so people can get access to it when they need it. That extends all the way from the creation of the ecosystem itself, to the creation of all the standards. We’ve been instrumental in creating and pushing for a couple of different open standards bodies. One is the WInnForum Spectrum Sharing Committee, which we started and still co-chair with the Google team. The Winn Forum is turning the FCC CBRS rules into technology standards. The other is the CBRS Alliance, to help with the commercialization of shared spectrum, specifically for LTE. We founded the CBRS Alliance along with Qualcomm, Intel, Google, Ericsson, Nokia, and Ruckus. The Alliance now has over 60 members with cable companies, tower companies, and all 4 top US mobile operators. In this new world of shared spectrum, a lot of the standards, a lot of the policies and regulations are left to the industry to work on as a group in open forums. Once that’s done in either one of these two forums, then equipment makers can build equipment once, and it’s usable by anybody in the system. What we’re doing right now is helping in all three areas of the ecosystem. We help with all of the underlying support for the regulatory bodies and the standards bodies to figure out how to make shared spectrum work. We’re also building the actual systems that would manage the spectrum, the Spectrum Access System (SAS) and the Environment Sensing Capability (ESC), in order to make spectrum accessible. And we’re helping with the commercialization of shared spectrum. For example, in the CBRS Alliance we’re helping to create places where you can commercially test the interoperability of any CBRS equipment with other pieces of equipment and be able to simplify that model. Ultimately, what we present commercially in the marketplace is a spectrum controller product, where someone can subscribe and get access to spectrum, and they pay for only the amount they use when they need it. Monica: There’s a regulatory framework from the FCC to enable all of this, but at the same time, the success of CBRS is tied to the fact that all the ecosystem players – all the way from the vendors to the service providers, and the enablers – cooperate to make shared spectrum work, as you said. IT SOUNDS LIKE THE PROCESS IS PROCEEDING SMOOTHLY, despite the number of competing interests involved: the legacy users, the military, the wireless ISPs, all the way to anybody that wants to use the spectrum and is registered to do so. Iyad: It’s going quite well. The important thing about spectrum is that it’s either highly used, highly concentrated, everybody wants it, or it’s spectrum that’s barely used. There’s no middle of the road for spectrum, because once you make it viable from an ecosystem perspective, and once you start seeing economies of scale from chipsets, devices, equipment, and so on, everybody wants to use that spectrum. It’s a lot cheaper if there are ways you can get access to it without lengthy and costly spectrum auctions. For CBRS, we started the process almost three years ago, working first with the federal incumbents. As a matter of fact, our founder started even before then, working with the incumbents to understand what are the special needs of the spectrum users, how we can protect their privacy and security, and so on. Then we formalized those discussions, along with the Google team, two-and-a-half years ago. That’s when we started building the Spectrum Sharing Committee within the WInnForum, invited the government entities that had an interest in it, and started making sure we had enough representation from the commercial sector. Now there are more than 80 entities in WInnForum. A significant number of them are a part of the Spectrum Sharing Committee and have contributed quite a bit. That includes carriers, cable companies, equipment makers, and chipset makers. The first piece of success for us was to have entities getting together to work through things in an open, quasi-governmental, commercial forum where everybody was comfortable, with the endorsement of the FCC, NTIA and others. We created a good environment to do the work. As we evolved a bit more, about a year ago, we started figuring out how to create commercialization in general, meaning that it’s not enough that the spectrum is available. You have to chop it up and share it, but also how do we make sure we can build LTE systems on it? How do we understand interoperability with things like MulteFire, and 3GPP, and the small-cell deployment schemes? We relied heavily on partners like Qualcomm, Intel, Google, Ericsson, Nokia and Ruckus to begin that process. Now we have the CBRS Alliance launched, and it has more than 60 members and continues to grow. Our thinking from day one was that you build a product at the same time you build the ecosystem, because the ecosystem is where the product comes from. Alongside all of that, we’ve worked to educate regulators on what’s needed. We look for changes in policies, if needed, for example in power levels, or in ways to create licensing. We work through any conflicts between members, find ways to mediate that, and come up with technology solutions along the way. We’ve had a beta product for our spectrum controller for over a year. We have 40 trials signed. A good portion of them have already gone through. We have more than 15 OEMs integrated. We are now down to one to two days to integrate an OEM into our spectrum controller. Ahead of Mobile World Congress, we announced integration and collaboration agreements with both Ericsson and Nokia, along with other partners we’ve announced in the past, like Ruckus and Telrad. We continue to build an ecosystem. We want to create a neutral and open place where users can understand how spectrum sharing works and ensure that the platforms are open. These bodies allow for competition, but also everyone affected gets to present their needs so nobody is left behind. There’s equality here for all of us to have to share, and all of us to have our needs met. Monica: Let’s talk a little bit about THE BUSINESS MODELS THAT CBRS WILL ENABLE. There is great scope for innovation here. Iyad: There are many, many business models emerging. As a matter of fact, we’ve seen about 10 or 12 business models so far in this process. The ones that are very obvious are small-cell densification for carriers and operators, and indoor deployment as network extensions for operators. Then you go up from there. We’ve seen people look at CBRS to create new managed service models, the so-called neutral host. Instead of the current process where you use DAS equipment that is quite expensive and limiting in terms of number of locations, people plan to replace that with 3.5 GHz small cells that are shared among service providers. In this neutral-host model, you do not just share the spectrum, you also share the radio. You share the infrastructure, and you can create a managed service model, where multiple users can use it. That’s a new model that we expect will gather some steam, because it’s usable not just for operators, but also for enterprise customers. We see a lot of interest in private LTE for enterprise customers, specifically from industrial and logistics companies. There’s a lot of work now on creating ways you can add 3.5 on top of fully implemented Wi-Fi as a private LTE model. Back in October at Dell World, with Ruckus, Qualcomm and Dell, we demonstrated what a private LTE side by side with a Wi-Fi system looks like. You’ve seen a lot of announcements about trials of private LTE. We’ve seen requests from logistics companies to see how to use it. Convention center and sports facilities owners are looking to create private LTE networks in order to offload their Wi-Fi networks and to improve security. New applications at public locations include VR, and pumping content to any seat to give people additional ways to enjoy the event they’re attending. I had initially anticipated that private networks would start later, but there is a lot of momentum behind private LTE already. We expect new entrants to come in as well – whether they are cable operators rolling out a mobile service, or companies aspiring to be managed service providers. This system allows them to get to enterprise Wi-Fi-type economics with a shared LTE model without the very, very steep spectrum costs and other costs of LTE in licensed bands. There are other, adjacent models. For example, we’ve seen trials for point-to-point last-mile replacement. Companies can do 5G-type applications, although they’re done on gigabit LTE, to see how they can maybe get backhaul replacement, especially as they deploy small cells. We’ve seen people look at how to use spectrum sharing for home IoT hubs: security cameras, connecting the thermostats, and even providing some meshing between the different boxes in home applications. We’ve also had the traditional WISP business. That is a big beneficiary of spectrum sharing, because they already operate in 3.5 GHz, and they now get more spectrum, more access. Some of the big players, like Google, have announced that they would like to use some model for wireless backhaul to extend their fiber networks. There’s been a lot of interest in that as well – a WISP on steroids, if you would. There are many applications. We’re looking at a large number of interested users from different spaces. That’s really what makes the ecosystem quite exciting: the scale that everybody would gain out of a shared spectrum ecosystem is massive. To find out more about when we can expect to see commercial deployments in the 3.5 band in the US, how this will have a global impact and the impact of our spectrum controller, tune in here or download the transcript here.